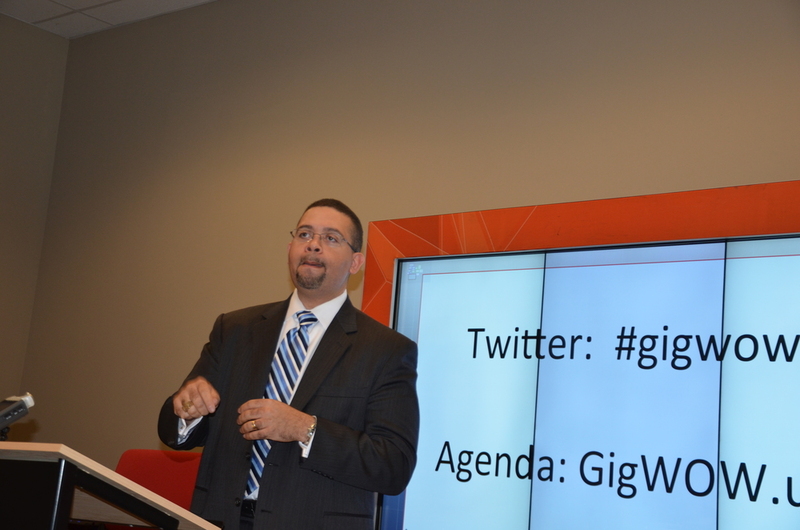 Over 130 business leaders from across the Piedmont came to see what Gigabit Internet means at Charlotte’s first GigWOW Experience held on Sept. 17. DC74 Data Centers hosted the event and provided a Gigabit Internet connection. This connection enabled demo companies to show off their Gigabit apps, and for attendees to try out Gigabit speed for themselves. The theme of the event was: See the possibilities of what can be done with faster Internet. See it. Touch it. Experience it. The event began with a keynote presentation from City of Charlotte CIO Jeff Stovall, who described the unbounded opportunities a Gigabit Internet platform will provide. He remarked “It isn’t just doing more on the Internet faster, but it’s about having a platform that can change the way you think. It’s about having a platform with the ability to move data with low latency.” Jeff went on to say that it’s not just data, it’s the ability to capture, process, and analyze data in seconds. “It’s interactivity”. Jeff admitted that “no one knows definitively how Gigabit Internet will lead to changes in Charlotte, but we know it will be exciting”. We couldn’t agree more! AT&T and Time Warner Cable (TWC) representatives were present and updated the audience on their infrastructure upgrades in the region. AT&T GigaPower is available in some areas of Charlotte and Gastonia (check GigaPower availability here) and TWC is in the process of upgrading their network to Maxx speeds by the end of the year (see TWC details). Mary Ellen was quickly put on the spot to answer when Google Fiber will be available in Charlotte. With nearly 4000 miles of fiber to install, the construction efforts will take a long time. She said that while they are going as fast as they can, Charlotte is about a year away. Google Fiber chose Charlotte for a lot of reasons, including our fast growth and our efforts to transform our community. In Kansas City Google Fiber has witnessed a startup community that came out of nowhere, with a group of fiber homes KC Startup Village, and a startup commercialization program Digital Sandbox KC. Mary Ellen told us that Kansas City is now referred to as Silicon Prairie! Valerie described the mission CMS created in 2012 to create the 21st Century Learning Environment. It was a high goal at the time as none of the schools were fully wireless, the teachers were nor given laptops, there was no guest network, and the school computers were running XP. Now the schools have wireless and every student in grades 5-9 have access to a Chromebook. “Digital Learning is a revolution” explained Valerie. In 2015 home Internet is “as essential as lights, water, and other basic utilities”. Increasing student engagement, and extending learning time beyond the school day are key CMS objectives. Eric remarked that it’s one thing to consume access, but it’s another to be truly systems literate and have a deep understanding of the tools. Teaching students to code, design, tell stories, and understand value based criteria that are embedded into the architecture of the information system is key. “We are seeing an alignment of work, play, and learning” Eric explained, which is “dependent on high speed Internet”. Our opportunity is to turn technology on its head and playfully engage the general public. Creativity and experimentation paves the way for leveraging technologies like Gigabit Internet. Fred described how the Internet not only has transformed the distribution side of the film business, but also on the production side since everything is file based. It is now possible to develop cloud based processes and IP workflows that could not be done before. The lack of latency and the increased speed of Gigabit is critical. “Our business has been transformed” said Fred. And it’s not just film, but online gaming as well. Gigabit “allows and enables a whole economy around game playing” remarked Fred. He compared high speed Internet with freeways, and how businesses will gravitate to the opportunity. And it doesn’t hurt in attracting talent to the area either! Cardinal Solutions demos a Gigabit app at GigWOW on a T1V ThinkHub display. The event concluded with hands-on time for attendees, who ecstatically reported speeds of 300Mbps + on their phones! Representatives were on-hand from Salisbury’s Fibrant network, and from the Gaston Gigabit Committee. Charlotte is fortunate to have two residential Gigabit service providers, Google Fiber and AT&T GigaPower, and a third residential ISP provider in TWC who provides 300Mbps Internet service. The high speed infrastructure will aid in Economic Development, Fostering Entrepreneurship, and Attracting Talent. The Charlotte Agenda reported “One person I spoke with at the event said his out-of-town friends are already talking about moving to Charlotte because it’s a Google Fiber city.” That’s what we want to hear! Do you want to stay informed on Gigabit Internet and future events like this one? Sign up for our mailing list via the link below.